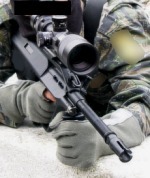 Airsoft snipers use the same techniques used by snipers in the armed forces. The most effective snipers are never seen by the enemy. Airsoft snipers employ the same techniques as their armed forces counterparts, often working in cooperation with differently equipped airsoft infantry units, drawing enemies into an ambush, or picking off officers from a distance. The rules for regular snipers go as well for the airsoft sniper. Creep in and make the shot from a hidden location. Perhaps an airsoft sniper has less to worry about in the way of Field craft. An airsoft sniper will most likely not be required to stay in the field for an extensive period of time without food or water, like a sniper in a tactical strike squad will probably be required to do. Also, the airsoft sniper will not have to carry a heavy, and potentially damageable piece of equipment across many miles.On the other hand, an airsoft sniper will benefit as much from properly implemented camouflage as an actual sniper. Some airsoft snipers have gone so far as to use airsoft ghillie suits as camouflage just like actual snipers. There are a multitude of options in weapons for the aspiring airsoft sniper. The spring action Super Nine Sniper rifle by unicorn hobby company comes to mind. It is a lower priced rifle, and a good place to start. Another excellent, however usually expensive, choice for airsoft snipers is the CA M24 SOCOM. This gun, made by Classic Army, is based off the U.S. Army's M24 sniper weapon system and is another airsoft sniper rifle often used by airsoft snipers. These are popular with airsoft snipers because with just a few modifications, a muzzle velocity of 500 feet per second can be achieved.